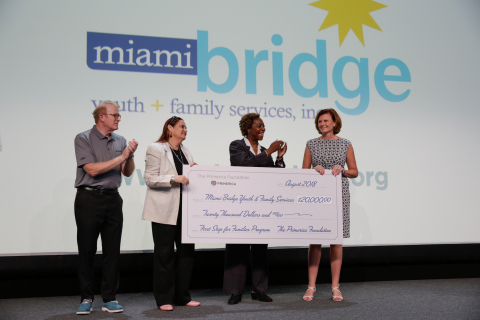 MIAMI--(BUSINESS WIRE)-- Miami Bridge Youth & Family Services has received a $20,000 Primerica Foundation grant in support of its non-residential, family crisis intervention counseling program. Miami Bridge’s First Stop for Families Program works with approximately 400 youth and their families each year. Funded by the Florida Network Youth & Family Services, Inc., through the State of Florida Department of Juvenile Justice, along with the United Way and local foundations, this program is designed to provide services to help families stay together. It diverts children from having to utilize emergency shelter services by providing short-term family crisis intervention assistance. The organization’s seasoned social work staff understands the frustrations that drive wedges between children and families. The Primerica Foundation is the charitable arm of Primerica, Inc., the Georgia-based financial services company. The Primerica Foundation gives funding support to programs that meet critical needs of families, and in turn, build stronger communities. Since its establishment in 2010, the Foundation has positively impacted the lives of tens of thousands of individuals. Miami Bridge’s non-residential/community behavioral services help local families, at-risk LGBTQ youth, and even truant students in the Miami-Dade County Public Schools system by making free counseling, case management and mentoring services readily available to them. Annually, Miami Bridge shelters more than 500 children and teens, providing over 10,000 care days for those individuals, as well as counseling to more than 550 families with children ages 6-17. The nonprofit’s efforts have resulted in 75 percent of youth reporting self-improvement or exhibiting a decrease in risky behaviors. About Miami Bridge Youth & Family Services, Inc.
Miami Bridge was established in 1985 and serves as Miami-Dade County’s only 24-hour emergency shelter for children and teens in crisis ages 10-17. For more than 33 years, the non-profit organization has worked to rescue youth in the community from lives of victimization and crime by providing refuge, protection and specialized care in a nurturing, stable environment. Annually, Miami Bridge shelters more than 500 children and teens, providing over 10,000 care days for those individuals, as well as counseling to more than 550 families with children ages 6-17. For additional information, please visit www.miamibridge.org.